Six games into the season, we’re in third place, a game and a half in back of Baltimore and half a game behind Tampa. Two teams that were, notably, picked by most to finish in the bottom half of the division. The team picked by most to win the American League East, your Boston Red Sox, is hovering at .500, thanks to two comeback wins. In the six games they’ve played, they’ve scored 22 runs. Of the 57 innings they’ve been on the field, they’ve scored runs in nine of them. Only five clubs have scored fewer runs than the Red Sox, and only five have hit for less power. Last year’s $217M free agent pitcher (Price) has yet to make a start and just threw off a mound today for the first time due to elbow problems. Last year’s major addition to the bullpen via trade (Smith) threw three games for the Red Sox in 2016, had Tommy John surgery and isn’t projected to be back until June. This year’s major addition to the bullpen via trade (Thornburg) injured his shoulder in spring training and is only just now beginning to throw. The expected platoon partner at third base (Rutledge) injured his hamstring days before breaking camp. Two players (Bogaerts and Barnes) have missed time on bereavement leave. The former missed an additional game because his return flight from leave was cancelled and a charter couldn’t be arranged in time. Five active players (Betts, Kelly, Moreland, Ramirez, Ross Jr.) have missed games due to the flu, one did not miss a game but threw up in the middle of one (Benintendi), and two currently on the DL (Rutledge and Thornburg) have also taken ill. The flu has gotten so bad that the play-by-play announcer (O’Brien) had to leave in the middle of the game, and the Red Sox decided to fumigate the clubhouse. Our centerfielder (Bradley Jr), off to a Gold Glove caliber start, was just put on the DL with a knee sprain. Tomorrow’s starting pitcher (Pomeranz), who had a stem cell injection in his elbow in the offseason, suffered triceps tendinitis and pitched poorly in spring training, started the season on the DL and is making his first start tomorrow and no one knows what to expect. Our replacement for any injured starter is a 32 year old pitcher (Kendrick) who didn’t play in the majors last season. Also, he gave up 10 runs in 6 IP tonight. Now while it’s true that issues like the flu can reasonably be expected to pass, there are multiple injury situations that could derail the Red Sox season. Most projection systems have already marked down their odds accordingly, in fact. Also, our depth is terrible. But if you were told before the season about the above, you’d take 3-3, right? Exactly. There’s really no other way to say this: Clay Buchholz has been a miserable pitcher in 2012. Sunday’s two run, 6k, one walk affair notwithstanding, Buchholz’ 2012 campaign has been a train wreck so far. Aside from Ubaldo Jimenez, he’s been the least valuable pitcher as measured by WAR (-0.3). Among AL starters, only five are giving up more home runs per nine. Among MLB starters, no one has a higher ERA than Clay’s 7.19. Most alarming, perhaps, is his MLB worst (starter) WHIP of 1.83: each and every inning, he’s putting almost two guys on base by walk or hit. Tough to win games that way, though he’s managed to squeeze out four thanks to his MLB best run support which is just this side of two touchdowns per game. The question isn’t whether he’s been bad, however, it’s what to do about it. The talk show shouters, of course, would have us dump him for spare parts. More rational commentators would have him succumb to a phantom injury and get himself sorted in the minors where we wouldn’t need the offense to scare up ten runs to win every five days. That approach might yet be the correct one, but Sunday’s start offered at least some hope that Buchholz will start being Buchholz, sooner rather than later. Looking closer at the numbers, there are a few other signs that he might regress at least towards being league average, which would sadly be a massive improvement over his performance to date. BABIP: Buchholz’s career average on balls in play is .289, which is almost exactly what it should be. This season, however, batters are hitting .342 on balls in play. Which, translated, they’re hitting fifty points better than they should be when they make contact. Unless the laws of baseball have been repealed, this is likely to rectify itself over the balance of the season, which in turn should forecast better numbers from Buchholz. xFIP: If it’s true that xFIP – which controls for defense and expected home run totals – has one of the highest correlations to future ERA of any metric, Buchholz should be happy. His xFIP of 4.97, while still poor, is far more palatable than his bloated (and league worst) 7.19 ERA. Buchholz’s xFIP is actually better than that of teammate Daniel Bard, which is obviously damning with faint praise, since the reliever turned starter has lost nearly five miles an hour of his fastball and is walking as many as he strikes out. Still, xFIP offers some hope that Buchholz may have better days ahead. Velocity: Anecdotally, it has appeared that Buchholz’s velocity has been ticking upwards in recent starts. The odd 94 here, 93 there, offered some hope that his arm strength has been coming back, slowly but surely. The metrics offer some support for this; the last time we looked at his average fastball velocity, he was at 91.8 MPH. Today, he’s up to 92. BB/9 / K/9: This is admittedly grasping for straws, but if you look at the graphs of his BB/9, K/9 and K/BB, they’re beginning to trend in the right direction. Ultimately, there’s nothing in the data that points to Buchholz reverting to his 2010 form in the immediate future. There are signs, however, that he is trending towards becoming at least a league average pitcher again, which is a start. And while his performance in the number three spot in the rotation has been a major disappointment, it’s been offset to some degree by the emergence of Doubront as an above average number four. In spite of his absymal performance to date, then, I’m inclined to put more faith in his history than his ten starts this season. I know he’s been awful, but have some patience. 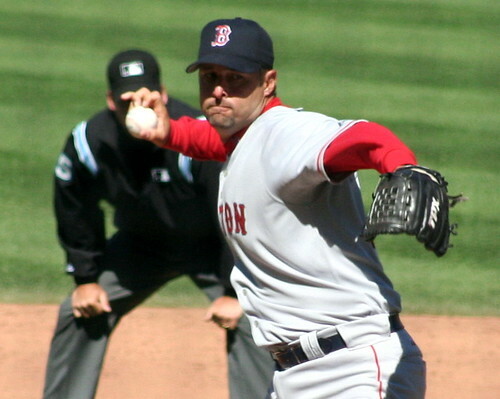 Wakefield Throws a Knuckleball, originally uploaded by Waldo Jaquith. Peter Abraham is right to be asking the question, because even the average fan at the game last night was asking the same question: who goes to the pen when Matsuzaka returns? My suspicion is that his answer – Wakefield – is also correct. And to his credit, he looked at the issue from a number of angles. I wish, however, that he’d gone just a bit further with metrics he used. So let’s do that here. Buchholz easily wins if ERA’s the metric, 1.80 to 6.38, but as Abraham noted ERA doesn’t tell the whole story. So let’s look at FIP, which normalizes the ERA to account for variances in league, defense and so on. Buchholz’ FIP is 4.51, which certainly feels more like how he’s pitched. Wakefield, meanwhile, is at 4.54. Translated, this indicates that Buchholz may have gotten a bit lucky, Wake a bit unlucky. And that even adjusting for luck, Buchholz has pitched more effectively. The ratios are a bit more mixed: Buch has the edge in K/9, 7.20 to 5.40, but Wake is walking fewer at 3.44 BB/9 to 5.40. One could make the argument, I suppose, that Wakefield has been profoundly unlucky when it comes to BABIP. In 2010 hitters are averaging .340 on balls in play. Given that his career average is .282, they’re hitting about fifty points better than they should. But while that’s likely to regress to the mean, resulting in a statistical improvement, it’s not likely enough to make him a better choice than Buchholz. According to the stats, anyway. Because as much as it might be easy to run a club by the numbers, Francona – bless him – knows better than that. There are a myriad of factors that will go into his decision, the numbers being but one of them. I think he’ll end up with Wake going to the pen, but it’s not as if the situation is cut and dry so there’s room for disagreement. All that I wanted to do here was add some context to Abraham’s statistics argument, which seemed to me to be lacking.